As part of my motivational speech, I had a joke relating to how we need to sometimes actively do things to make our lives fun. I talked about “Getting On Board” and also “Riding the Pony.” It was a metaphor. A joke. 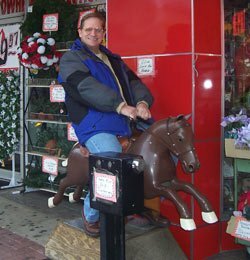 heart.He has clearly “gotten on board.” He has sent me photos of him riding a pony outside of a store (the 1¢ machine pony) and now check out his latest letter and photo. He gets it. He is having fun, because he is MAKING his life fun. He is doing wacky stuff, and the result can be seen in the smile on his face. What are you doing to Get On Board? What are YOU doing to actively create fun? Thanks David. Ride that pony! 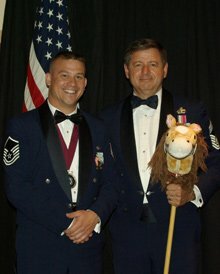 Looking for a military speaker or a motivational speaker for your military event? I hope you’ll consider me. https://www.bradmontgomery.com/wp-content/uploads/2018/11/logo-1-495x198-1-300x120.png 0 0 admin https://www.bradmontgomery.com/wp-content/uploads/2018/11/logo-1-495x198-1-300x120.png admin2008-05-28 03:46:082016-10-15 17:21:22Can The Air Force Have Fun? It should be cool, and has a ton of resources about motivational speakers, people who WANT TO BE a motivational speaker, and people who want to HIRE a motivational speaker. Hang on! It’s almost here kids! A cool blog just picked up one of my posts. If you’re looking to learn more about public speaking or professional speaking, this is a pretty cool resource. 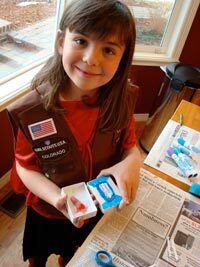 My wife and a pal of hers are Girl Scout troop leaders for some very cute Brownies, including our six year old. The afternoon was a gas. It was fun to see these sweet little girls turning themselves into a cross between magicians and gross-out-artists. And I was lucky to be part of all of that positive and fun energy. What’s my point? Part of the reason I had so much fun is that (although it was under the guise of “teaching” them how to become Colorado magicians) what we were REALLY doing was playing. And I had a ball. I found myself being silly. I found myself smiling and laughing. 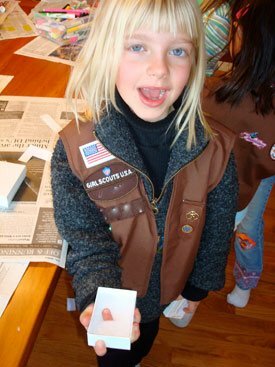 Basically, by playing with the Girl Scouts I went from being a serious grump to a pretty fun-filled guy? (I had a tough day at work that day.) So…. do you need a lift? Do YOU think you could benefit from more smiles and laughter? Of course you could. Thanks Brownies! It was a hoot! Need a magician speaker or Colorado based magician for your event? If you can’t book the brownies and their Mystic Fingers, I hope you’ll consider booking me. I was recently speaking in Virginia with a very well-respected comedian speaker. This guy has some killer credits and some amazing stuff on his resume. And he was funny. But his opening sucked. And in spite of his terrific skills, he never really one the crowd over. So, what did he do wrong? He started slow. Really slow. It took forever for him to get to his material. Once he was introduced he slowly stood from his seat in the audience. Then he greeted the introducer. Then he walked on stage. It’s a waste of time…. get to it already! Then he followed with a couple of banal questions… and then finally got to it. I wasn’t watching the clock, so I have no idea how much time there was between the time they said, “Please welcome comedian ______,” and the time he actually started into his material. And sure, it wasn’t minutes. It was seconds. But it felt like forever. His act was great. He’s a wonderful comedian speaker. And his material was really funny. But this particular corporate group was difficult. And in spite of his considerable skill and great material, he just never got them rolling. He didn’t fail. He just didn’t kill. And I’m convinced that part of his problem was that he started so slowly. You can do better than that. And so can this comedian speaker I just saw fall flat in Virginia. https://www.bradmontgomery.com/wp-content/uploads/2018/11/logo-1-495x198-1-300x120.png 0 0 admin https://www.bradmontgomery.com/wp-content/uploads/2018/11/logo-1-495x198-1-300x120.png admin2008-05-21 06:41:062008-05-21 06:41:06Speaking Tip: We're Bored By Your Intro! Jay is just such a friend. He is able to think easily in a way that makes my mind go numb. He is in my mastermind group of fellow Colorado Speakers. We met yesterday, and — as usual — Jay was able to help me see my speaking business in ways that help me more than I can say. I’m lucky….what he does for me and my fellow speaker pals is what he does for big and small businesses across the country and around the world. Before I met Jay I had no idea what Six Sigma was. In fact, if you would have asked, I’d have guessed it was a micro beer. (Or perhaps I was just hoping.) Jay has turned me into a Six Sigma fan. Jay Arthur is to Lean Six Sigma, what I am to comedy and humor…an addict. As much as I hate statistics, Jay loves them. of Lean Six Sigma Demystified. Besides all of this. He can crack a good joke. (In fact his wrote a killer book about thinking like comedians with another pal and fellow Colorado motivational humorist Karyn Ruth White) He also knows a good glass of wine. And is always ready with a smile and a laugh. What’s My Point? If you want to succeed (in just about anything) you need to surround yourself with people who think differently than you do. And then listen to them hard. If they are half as smart, fun and generous as Jay, you’ll be lucky. Thanks Jay! I’m glad we’re buds! PS. I’m not a six sigma expert yet. But I’m up to about two and a half sigma and working hard. https://www.bradmontgomery.com/wp-content/uploads/2018/11/logo-1-495x198-1-300x120.png 0 0 admin https://www.bradmontgomery.com/wp-content/uploads/2018/11/logo-1-495x198-1-300x120.png admin2008-05-20 17:36:322008-05-20 17:36:32We Need Friends Who Think Different. A while back I did my humorist motivational speaker thing for an awesome group of tax preparers in Augusta, Georgia. (Three days later we did the same event in Las Vegas.) My client, TAX SLAYER software was terrific, and the audience was totally responsive. It was really fun. But one of the most interesting things happened BEFORE I went on. I was to follow a presentation by a pair of “banking speakers.” (His name is Ray VandeWater, and he’s a big cheese at Chase Bank, and he worked with his business partner, Cindy.) Oh great…. I was to follow what was surely to be an incredible boring program. But I was wrong…they were terrific. Engaging, personal, authentic and entertaining. Ray VandeWater: “Well, after looking over the evaluations from the last time we gave this presentation, just let me tell you that apparently many of you are confused as to which one of us is which. Cindy is the short blond woman who defines grace, wits and beauty. I’m the old, tall, bald guy. What was the result? The audience laughed. And laughed some more. It was the perfect sort of self deprecating humor that made the senior speaker look really good. Instead of coming on reciting his credentials and experience, he made fun of himself. Now imagine the approach he could have taken. He could have had an overblown intro talking about his advanced degrees, his expertise, and generally how big a deal he is. Then he could have entered with some sort of joke he got from the internet. And then launched into what was — in effect — a sales pitch. The result from that approach would have been totally different. He would not have connected to the audience. He would have been WAY less successful as a speaker. Heard the old cliche about people buying from people they like? Yup…and guess what? The audience LOVED this banker. And so what follows? You bet. He does a ton of business with his audiences. Think humor has an important role in business? Me too. Thanks Ray. It was a pleasure sharing the platform with you. Learn more about my executive humor coaching & speeches. https://www.bradmontgomery.com/wp-content/uploads/2018/11/logo-1-495x198-1-300x120.png 0 0 admin https://www.bradmontgomery.com/wp-content/uploads/2018/11/logo-1-495x198-1-300x120.png admin2008-05-19 05:56:332008-05-19 05:56:33 A Banking / Financial Speaker Who Is Actually Funny. I blogged about the importance of creating customized and localized jokes and humor for professional speakers. The original post about my Mayo / Minnesota trip. I was recently working in Minnesota at the Mayo Clinic (How cool is That?!). Ok, so far, no big deal. I landed in Minneapolis and made the drive to Rochester. Again, so far no big deal. 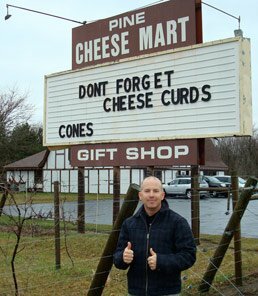 In the middle of the trip between Rochester and Minneapolis — out in the middle of nowhere — I passed a shop called the Cheese Mart which had a big sign outside advertising cheese curds. It struck me as funny (and unlikely) that anybody would stop at this remote store to buy cheese curds. Well, it turns out that the joke was on me. A huge percentage of the audience had been to this Cheese Mart. They love it. They go there often. The result of my cheese ignorance from stage was fun and funny. Really funny. That got me. On the way back to the Minneapolis airport I knew I had to stop. I had to try these squeaky curds. It was fun to visit the place I had mocked during my keynotes at Mayo. But it gets funnier. In some of my keynotes, including the one at Mayo, I sometimes demonstrate how to use a toy squeaker to play at work. How to make your phone squeak, your shoes squeak, your salad squeak… you get the idea. So of course when this wonderful Minnesota woman helped me find the “freshest” cheese curds I asked if they really do squeak. “Of course they do, honey!” she said. So I reached out with a squeaker hidden in my hand and “made” the bag of curds appear to squeak. It was fun for me, it was fun for the cheese woman. We both laughed. What’s My Point? I have a couple. If you are a speaker, or if you HIRE a motivational keynote speaker, hire somebody who will customize the keynote with localized humor. The cheese curds and Cheese Mart jokes were some of the best moments of the program. And the use of customized, localized humor helped connect me to the audience and vice versa. And that connection helps the message to stick. What’s My Other Point? I tell my audiences that if we want to be happy, sometimes we have to take action. Sure, it’s fun to NOTICE that life is fun. But sometimes we have to make an effort to MAKE life fun. And for me, the trip to the cheese store and goofing with the woman who works there was just that … it was fun. My mood was awesome once I had those darned cheese curds in my passenger seat. Can a Cheese Mart make you happy? What are the Cheese Marts in YOUR life? What are you going to do today — not watch, not read about….. DO — that will make today fun? Do you think cheese curds can change your day? Let me know your stories. Comment! I’m not sure if the best part of being one of the Minnesota speakers is the curds… but it sure was funny. PS. 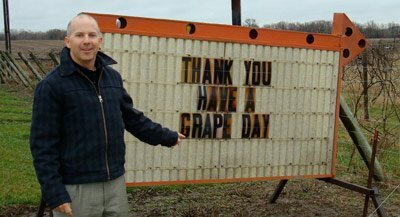 Check out this fun sign about grapes. Oh, those crazy cheese curd folks! Have a grape day? Get it? Nutty curd people! Ok, I admit it. I enjoy some of my motivational speaker jobs more than others. 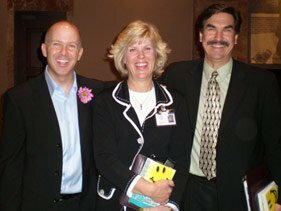 Working with the Mayo Clinic in Rochester, Minnesota was one of the dates that I loved. Why? There were several reasons. I really enjoyed that I got a tour of the Mayo campus from two of the top financial guys. They really helped me to understand the culture that makes their workplace unique. In addition, I got to share a couple of meals with Mayo meeting planners. Again, this time with them really helped me to connect with them and with the Clinic. It was a fun job: I was working for one of the most famous health care organizations in the world, but they didn’t want me for my experience as a health care speaker. They wanted me for my experience as a finance speaker; I was hired to speak for 1300 folks from their finance department. The room where I spoke was beautiful. And I mean beautiful. It was open and spacious while at the same time cozy. And the huge cool banners of the Mayo founders was a fun touch. I know, it’s small, but speaking in a nice venue helps make my job easy. What else? The audio visual stuff was perfect. This may sound like a small thing, but it isn’t. Having excellent lights and sound help make the speech a success in ways the audience will never understand. It’s crucial…and in Rochester it was perfect. In addition, my brother was with me. He was working in Minnesota and managed to swing his business trip around my road trip. He was there at the speeches with me which was very cool. Hanging with the big brother? How Cool Is That?! Mostly though, I’d have to end where I started. The people I worked with were first class, and I was proud as punch to be part of the Mayo team, even if only for the day. Thanks Ted, Leslie, Mort and the rest of the Mayo Finance gang! PS. Yup, I agree that it’s the can of soup that makes that Hot Dish sizzle. Making some tonight!